Fairfax Hall (right) with Sipsmith partner Sam Galsworthy (pouring) and head distiller Jared Brown. Sipsmith’s bespoke product has revived London’s craft gin industry. In the center of Sipsmith’s distillery stands a handsome copper-pot still named Prudence. 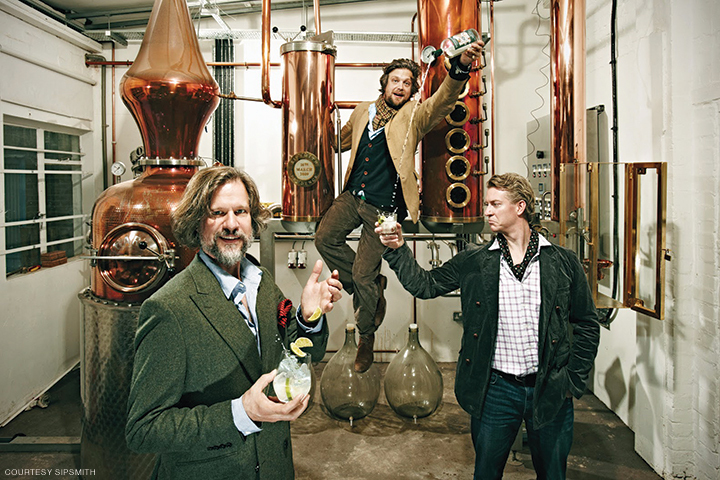 Fairfax Hall WG’04 and Sam Galsworthy, longtime friends and business partners, bought it just after receiving the license they would use to change London’s gin scene. That license, granted on December 9, 2008, allowed them to open London’s first new copper-pot gin distillery since 1820. The two men had had ample time—18 months, in fact—to think about their mission. Having seen high-end boutique operations producing all manner of alcoholic beverages pop up around the world, they wanted to do the same for gin. But while many of those other gin startups were experimenting with exotic flavors and methods, Hall and Galsworthy had a different dream. They would revive the classic juniper-focused London Dry Gin. After applying for the license, they backed up their ambition by quitting their jobs and soon found a warehouse in Hammersmith to serve as a distillery space. Then they ran up against an 18th-century law that prohibited the use of pot stills, the distilling apparatus used to make gin, for batches of less than 18 hectoliters (1,800 liters). The law had been designed to prevent unskilled and/or unscrupulous entrepreneurs from brewing unregulated spirits in their basement, and since there was a time when one in every four London homes was making gin, the legislation had once made sense. But by the 21st century, it was strangling the craft gin industry in its cradle. “We thought this was ridiculous, anachronistic, frankly draconian,” says Galsworthy. For a year and a half they staged a legal battle, meeting weekly with Members of Parliament and forming lobbying groups with other interested parties. Finally, the provision to repeal the law was buried deep inside the Finance Act of 2008. On December 9 of that year, that bill and its stowaway provision was passed. Now the two entrepreneurs could start making gin the right way. They soon hired Jared Brown—a renowned drinks historian and gin expert who got his start bartending at the Rainbow Room in New York—as head distiller. In doing so, they helped usher in a gin renaissance—what some Londoners call, not so dryly, a “ginaissance.” Ten years ago there were just two distilleries in the city; at last count there were 24. According to the Wine and Spirits Trade Association, exports of British gin have reached half a billion pounds, a 32 percent increase in five years. “With justification Sipsmith can be held up as the catalyst for what is now a growing craft gin industry,” says Nicholas Cook, director general of the Gin Guild. Hall and Galsworthy embraced the competition they unintentionally created, releasing their gin recipes online and bringing in rival companies for tours of their distillery. They had reason to be confident in their product, which has won several gold and silver medals in international competitions. In 2015 a representative from the House of Commons approached them with a proposal. The result was Sipsmith House of Commons Gin—a special-edition London Dry Gin that boasts “deep juniper notes and a heavenly citrus finish,” in the words of Sipsmith’s website. It’s served to MPs in all eight of Westminster’s internal bars and can be purchased in the Commons’ Jubilee Gift Shop. Today Sipsmith gin (now part of Beam Suntory’s portfolio) is exported to over 50 markets. While the company won’t reveal how much gin it produces annually, it allows that the brand has grown 344 percent since December 2016. To keep up with the increased demand, they’ve added three new stills: Patience, Constance, and Verity. But they are still a tiny startup compared to other more established brands like Beefeater, says the 43-year-old Hall, who grew up in a well-heeled family in Cornwall, 30 minutes from Galsworthy. Their families socialized often—the boys playing sports in the gardens while their parents mixed gin martinis in the portrait-clad dining rooms—and as adults, both men carried on the gin-bibbing tradition. After attending the University of Edinburgh, where he studied French and Spanish, Hall became interested in business and entrepreneurship. Four years with LEK Consulting paved the way to Wharton, where he mastered the basics of marketing, finance, and management. While Hall was busy getting his MBA in West Philadelphia, Galsworthy was in New York, working in sales for Fuller’s Brewery. The old friends spent their days exploring classy cocktail bars in both cities, as well as “edgy places in South Philly that we probably shouldn’t have gone to,” says Hall. Much as they loved the new craft beers, wines, tequilas, and vodkas they were sampling, they couldn’t help noting that gin was not part of that scene. “The young people coming up decided what to drink, and they were not choosing gin,” says Hall. Five years later the two packed their bags, moved to London, and began lobbying the government. The company’s newer distillery is in Chiswick, an affluent neighborhood not far from Heathrow Airport, and its young, playful staff members (with titles like Minister of the Ginterior and Head of Ginternational) are part of the attraction for visitors. There is also international interest in the brand. According to the Financial Times, one-third of Sipsmith’s sales are abroad, its biggest overseas markets being the United States, Australia, and Japan. That global interest enticed Beam Suntory to buy the brand for 50 million pounds in December 2016. While Galsworthy is the gregarious sales guy, Hall is known internally as the responsible one, the man who crunches numbers and keeps operations in line. Currently his biggest challenge is keeping up with demand.